When the turkey hunting is tough and the gobblers are quiet, your best option is to "run 'n gun" and cover ground until you get on 'em. H.S. Strut gives the perfect solution to staying mobile and hidden at a moment's notice, no matter where the hunt takes you. When the turkey hunting is tough and the gobblers are quiet, your best option is to "run &apos;n gun" and cover ground until you get on &apos;em. H.S. Strut gives the perfect solution to staying mobile and hidden at a moment&apos;s notice, no matter where the hunt takes you. The Conceal and Carry Ground Blind&apos;s level of flexibility and concealment makes it the perfect tool for extended sits or "run &apos;n gun", on-the-move style hunting. The H.S. Strut® Conceal and Carry Ground Blind deploys within seconds, and is ready to be on the move again in the same amount of time. The built-in tripod allows a stable gun to be ready for the moment of truth, and the extreme amount of adjustability provides options for concealment from multiple angles. 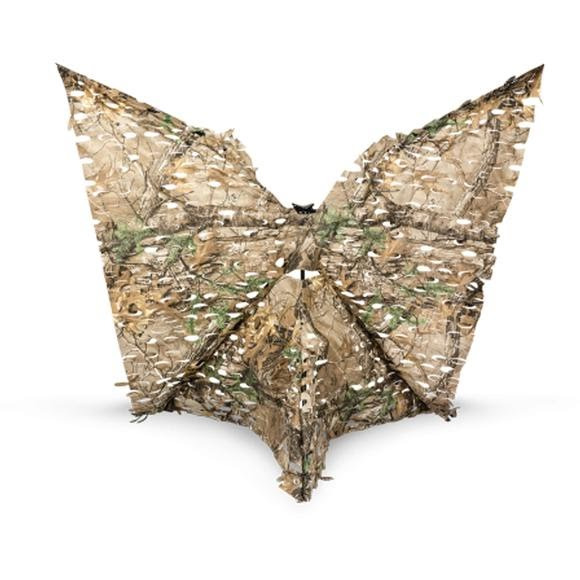 3D leafy die-cut material in Realtree® Xtra Green camo disappears into the surrounding terrain. Don&apos;t just give up and go home, stay on the move with the Conceal and Carry Ground Blind from H.S. Strut®.